Assateague Island is a 37-mile (60 km) long barrier island located off the Atlantic coast of Maryland and Virginia, United States. 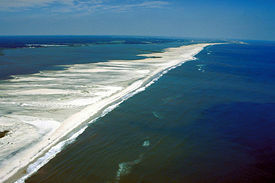 Barrier islands consist mostly of sand, formed primarily by waves and longshore currents. Occasional strong storms drive waves and sands so forcefully that beach and shoreline become dramatically changed. Assateague is separated from the mainland by the Chincoteague Bay and Sinepuxent Bay. It is spanned by two bridges; one from Sinepuxent, Maryland, near the northern end of the bay, and the other from Chincoteague, Virginia, near the southern tip. No road runs the full length of the island. It is best known for its pristine beaches, diverse and rich wildlife, and its herds of wild horses known as the "Chincoteague ponies." The island has three protected areas including a state park, a protected seashore area, and a bird sanctuary and wildlife preserve. It has been designated a World Biosphere Reserve, a National Natural Landmark and a National Seashore. Aerial view of Assateague Island. Ocean City Maryland is visible in the far distance at top. View is to the north. The 1933 Chesapeake Potomac hurricane created the Ocean City Inlet between the town and Assateague Island. Following the storm, twin stone jetties were built to maintain it for navigation purposes. The storm also destroyed a railroad bridge heading into Ocean City while creating the Ocean City Inlet. The result included accelerating coastal erosion and loss of critical beach and dune habitats. A 25-year restoration project began in 2002, and if successful, could become a model for other coastal regions suffering from disrupted littoral processes and land loss. A deer walks along the Snow Goose Pool in the Chincoteague National Wildlife Refuge. Assateague Island stretches for 37 miles (60 km) along the coasts of Maryland and Virginia. To its east is the Atlantic Ocean and to its west are the Sinepuxent and Chincoteague Bays. It is part of a vast chain of barrier islands along the Atlantic and Gulf coasts extending from Maine to Texas. Barrier islands are highly dynamic places, as currents and storms continuously reshape the land form. They are affected by changing sea levels and movement of offshore sediments. Long shore currents continuously transport sand south along Assateague's coast. Seasonal changes involve harsh winter weather which pulls sand from dunes and upper beaches and deposits it into offshore sand bars, reducing the beach width. In the summer, gentler wave action restores the shoreline. The island covers an area of 39,680 acres (160.6 km2/62.00 sq mi), and hosts a surprising number of natural features and habitats. Its variety of plant populations is the result of differences in elevation and in the proximity to surrounding water bodies. Along the seaward side, sandy beaches extend the length of the island. Inland from the shore, natural and human-made dunes protect habitats from salt spray and ocean waves, allowing shrub thickets and pine forests to thrive. During periods of rain, many freshwater pools form in depressions in these areas. The island is moving westward as a result of sea-level rise and the force of the surf through a process called "island rollover." Sand is eroded from ocean beaches during severe storms, carried across the island by flood waters, and re-deposited in marshes along the western shore. While this moves the island westward, it brings it closer to the mainland. Strong storms can also cause inlets to be carved through the strong movement of sand, which occurred in 1933 resulting in the separation of Assateague and Ocean City. Long shore currents can eventually deposit sediments and close these gaps unless, like the Ocean City inlet, it is maintained with jetties and dredging. Blue Crabs are harvested from the island's sheltered bays and inlets. Despite the often harsh conditions that occur in a coastal environment, a wide variety of animal species have managed to find a niche on Assateague Island. Each of the island’s different ecological zones provides habitat for a multitude of animals, including birds, mammals, reptiles, amphibians, and invertebrates. Seven species of frogs and toads depend on fresh water ponds in the center of the island for breeding. A variety of snakes are found across the island's forests, dunes, and marshes. The coastal waters that surround the island teem with animal life, some of which are commercially important, such as the blue crab. A variety of fish migrate into the estuary to breed. Later, the juvenile fish provide an abundant food source for birds, marine mammals, and larger fish. Many bird species make their home on Assateague on a seasonal basis. Tens of thousands of shorebirds depend upon the island’s supportive environment during their twice-yearly transcontinental migrations. There are over 320 species that are known to inhabit the island during some portion of the year. These include numerous varieties of bitterns, herons, ibises, blackbirds, finches, doves, cuckoos, owls, swifts, gulls, terns, larks, swallows, jays, crows, gannet, pelicans, cormorants kinglets, thrushes, thrashers, loons, grebes, rails, cranes, sandpipers, shearwaters, storm, petrels, tanagers, sparrows, vireos, wood warblers, titmice, nuthatches, wrens, vultures, hawks, falcons, woodpeckers, flycatchers, and waterfowl. The "Chincoteague Pony" is a hardy breed of horse that developed on Assateague Island and live there in a feral condition. Two separate herds of ponies are maintained on the island, separated by a fence that runs down the Maryland-Virginia state border. The Maryland horses are owned and managed by the National Park Service, and are free-roaming wildlife. In Virginia, these horses are owned by the Chincoteague Volunteer Fire Department and are fenced in large enclosures. The National Park Service no longer refers to the island horses as feral, meaning they are descendants of domestic animals, rather than wild horses. Although the horses are descendants of domesticated animals, their behaviors are consistent with their ancient ancestors. The breed varies greatly in physical characteristics since there is no true breed standard. Chincoteagues are known for being easy keepers and often do not require shoes. Most are between 13 and 14.2 hands high, but when raised under domesticated rather than feral conditions, some have been known to reach 16 hands. Chincoteagues come in a variety of colors and patterns, with pinto being common. It is important to limit the number of wild horses on Assateague. Left to themselves, the horses would quickly destroy the environment that sustains them. Virginia’s privately owned herd produces 60-90 foals every year. Most of the foals are sold at the annual auction, which keeps the number of horses at or below 150 adults. To control over-population on the Maryland side of the island, researchers developed a non-hormonal, non-invasive vaccine to prevent pregnancy. The National Park Service has used this contraceptive system since 1994. There are two theories of how the ponies came to live on Assateague Island. The legend is that a Spanish galleon wrecked off the island and the surviving ponies swam ashore. However, the more likely theory is that early seventeenth-century colonists let their animals loose on the island to avoid the tax on fenced livestock. Whichever theory is true, the free-roaming ponies of Assateague have been living there for hundreds of years. Assateague Island is comprised of three separate protected areas, each managed by a different agency, with the intent to protect and preserve Assateague's ecosystem of wildlands, wildlife, and outdoor recreation. These are the Assateague Island National Seashore, the Chincoteague National Wildlife Refuge, and the Assateague State Park. The Assateague Island National Seashore was established in 1965 to preserve the barrier island, surrounding waters, and provide recreational opportunities. It is a unit of the National Park Service and occupies both the Maryland and Virginia sides of Assateague Island. It lies adjacent to the island's other two protected areas, the Assateague State Park and Chincoteague National Wildlife Refuge. In the 1950s, some 5,000 private lots comprising what is now National Park Service land were zoned and sold for resort development. The Ash Wednesday Storm of 1962 halted the plans for development. The Nor'easter destroyed the few existing structures on the island and destroyed roads. Assateague State Park is a public beach and state park of Maryland that lies at the northern end of Assateague Island. It comprises nearly 800 acres (3.2 km²) and is the most developed area on the island with 350 campsites. It is managed by the Maryland Department of Natural Resources. Most of the water around the island is within the boundaries of the national seashore. Reachable via Route 611, across Sinepuxent Bay via the Verrazano Bridge (not to be confused with the Verrazano Narrows Bridge), Assateague State Park offers beaches and campsites to the public for a fee. The park lies adjacent to Assateague Island National Seashore. The Chincoteague National Wildlife Refuge is a 14,000 acres (57 km2/22 sq mi) wildlife preserve operated by the U.S. Fish & Wildlife Service. It is primarily located on the Virginia side of Assateague Island with portions located on the Maryland side of the island as well as Morris Island and Wildcat Marsh. The Refuge was established in 1943 to protect native and migratory species of wildlife and their habitat. Management programs are in place to enhance the area for the benefit of migratory and nesting birds and as well as indigenous wildlife. Diagram of a littoral zone and its subregions as defined by the United States Navy. Complex natural processes such as storms, changes in sediment supply at the coast, and sea-level rise results in coastal erosion. In the past century man-made alterations in the coastal zone have increased the rate of erosion. At the same time, explosive population growth and development has occurred along the nation's coasts. During a 1933 hurricane, an inlet opened in Ocean City. The U.S. Army Corps of Engineers soon thereafter built twin stone jetties to maintain the inlet for navigation. These jetties severely disrupted littoral-inlet processes, trapped sand on the north side of Fenwick Island, and severely starved the National Seashore area of sand. They have also resulted in accelerated erosion, reduction and alteration in beach-berm heights, and loss of critical beach and dune habitats. A restoration project began in 2002, partnering the National Park Service, the Army Corps of Engineers, and the Minerals Management Service. The 25-year project involves mechanically dredging sand onto the Assateague Island beaches in a phased approach intended to replicate natural processes. If successful, this plan of restoration could become a model for other coastal regions where engineering structures have disrupted littoral processes and caused increased erosion and land loss. ↑ 1.0 1.1 Prince Georges Audubon Society, Assateague Island Retrieved February 17, 2009. ↑ Assateague Island, Assateague Bird List Retrieved February 17, 2009. ↑ National Park Service, The Wild Horses of Assateague Island Retrieved February 17, 2009. ↑ Jeff Williams (November 2002), USGS Research Contributes to Assateague Island Restoration—Mitigating 70 Years of Coastal Erosion Due to Ocean City Inlet Jetties U.S. Geological Survey. Retrieved February 17, 2009. Assateague Island.com. Assateague Island National Seashore Retrieved December 6, 2008. National Park Service. Assateague Island National Seashore Retrieved December 6, 2008. United States, and William Hopkins Amos. 1980. Assateague Island National Seashore, Maryland and Virginia. Washington, D.C.: The Division. Amrhein, John. The Hidden Galleon Assateague's most famous shipwreck. Glass, Gary. Photography of Assateague ShutterGlass.com. This page was last modified on 21 April 2016, at 15:42.